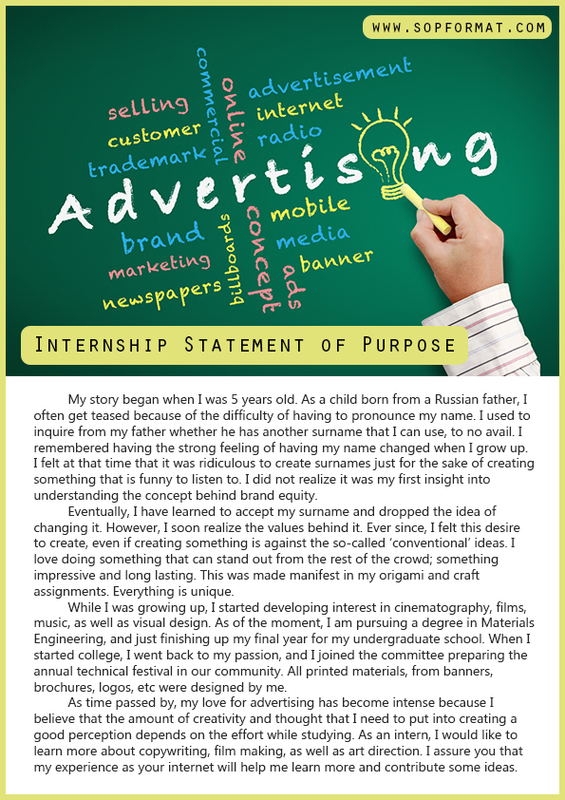 Why Do You Need to Know How to Write a Statement of Purpose for Internship? Writing a statement of purpose for internship is a vital part of your application for a place. It is your chance to show clearly to the admissions committee why it is that they should be looking to accept you onto their program. Often there will be little to choose between you and the many other applicants so your statement must be capable of making you stand out. This is why you must write something that is going to be at least as good as our statement of purpose for internship sample. What Is the Correct Statement of Purpose for Internship Format? Use an easy to read font: it should be at least 12pt in size and be something that is very easy to be read. Do not use fancy scripts that may not be easy to scan. Use clear margins of at least 1” on all sides of your paper. You do not want your paper to appear cluttered and filled. Avoid all forms of decoration: you should not be using borders and other graphics on the page, you want them to look at what you have written not your artwork. Do not submit on coloured paper: use black text on white paper only for your statement. Avoid all forms of text formatting within your writing: do not use excessive amounts of bold, italics or capitalization to draw attention to areas within your writing. What does the program actually ask for: often they will specify the information that they are looking for within your statement and you should always ensure that this is covered fully. Is there a prompt to answer: often you will be expected to answer a specific question through your essay. Ensure that you fully answer it rather than simply trying to write a generic statement. How did you become interested in this field: they will want to understand how you decided to follow your education and career in this specific area. What skills make you particularly suited for a career in this field: they will want to know why you are going to be a good pick for their internship. What specific skills and other attributes do you bring to their program: you need to clearly show that you are going to be the right person to accept. What are your future career aspirations: show where you hope to take your career after you have completed your internship. Why are you applying to their program: show clearly why you have selected their internship rather than another. Moreover, it’s worth visiting our site where you may get additional information about statement of purpose format for MS. Ensure you know their requirements before you start: check for any specific prompt that must be answered or a specific statement of purpose for internship format that must be followed. 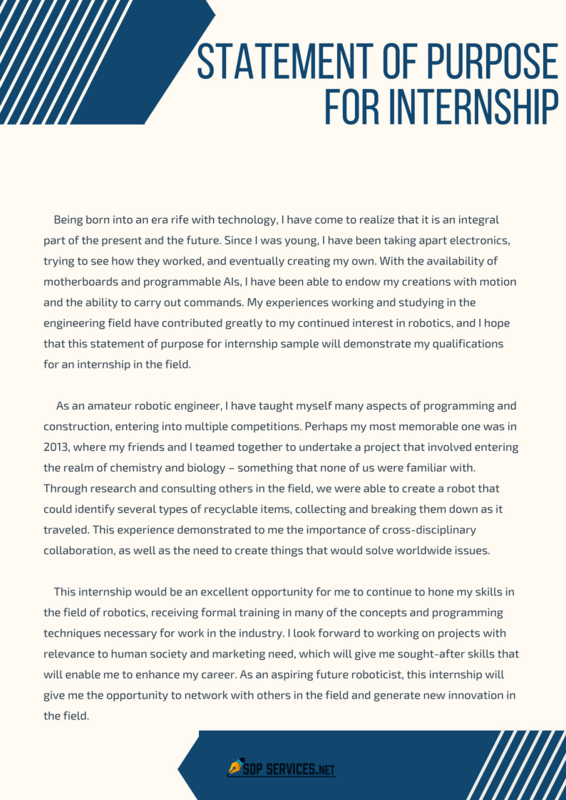 Review a good SoP for internship example for ideas: do not however simply copy anything as plagiarism is something that must be fully avoided within your unique statement. Review what they look for in a student: take time to look through their website and other materials to discover precisely what they want in a student. Tailor your statement with care to reflect precisely what the admissions committee will be looking for. Do not simply use the same generic statement for each application. Open with a strong hook: your first line or two must be capable of making the readers want to know more about you. Tell a story: use an anecdote that is relevant to the field as a storyline for your statement so that you keep the attention of the readers. Use simple language that everyone can understand: do not try to be clever with fancy words that may be misunderstood and avoid acronyms or slang in your writing. Talk about yourself: do not talk about other people or things within your writing. The committee wants to know about you and what your goals are for the future. Show your abilities with clear examples: making claims without backing them up with an example will not help you. Proofread all that you write: simple mistakes that you let slip through to your application could easily see your statement being overlooked for another. 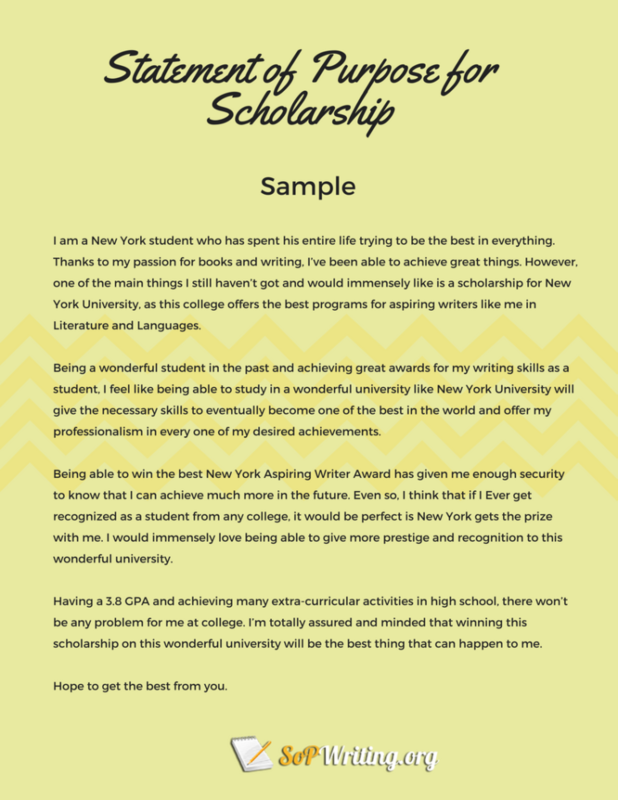 Your statement of purpose for internship will serve as your first impression; this should be effective in order for your readers to easily see your potential. A sample is efficient tool that you can utilize in order to understand the main components of a winning statement of purpose. Competing in a tough internship program can be tough but not impossible especially if you can submit a proficient and high quality statement of purpose. Start writing the best internship statement of purpose or pharmacy SOP and secure a spot to internship programs! 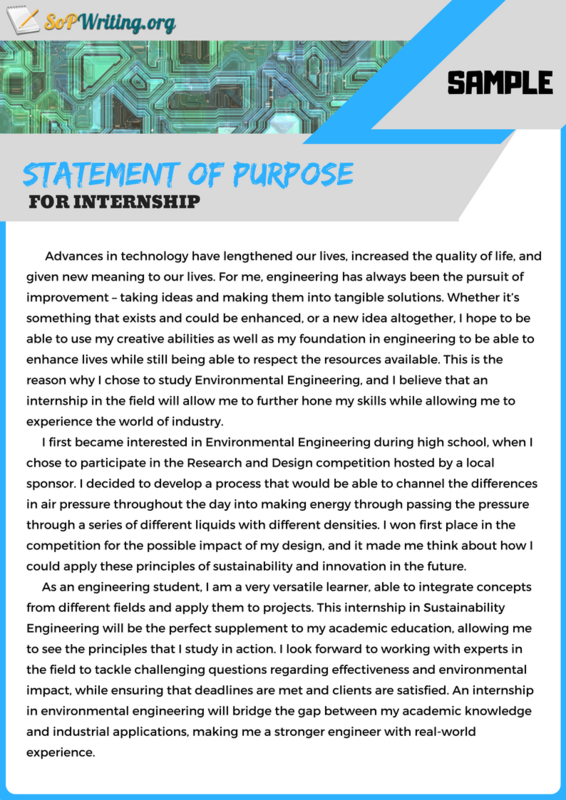 Use our internship statement of purpose guide, sop for internship example and advice to submit the best attention-grabbing application today!